The Anglican Church of Transfiguration, in Elizabeth PA has developed a unique way to aid residents in the Special Supplemental Nutrition for Women, Infants and Children (WIC) and the Supplemental Nutrition Assistance Program (SNAP). 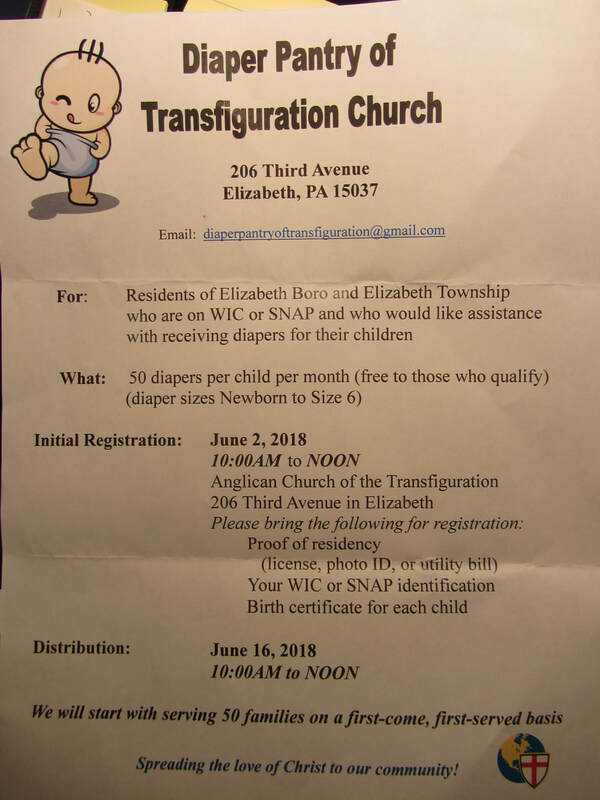 The Church of Transfiguration started a diaper pantry as part of an outreach ministry that provides disposable diapers to residents of Elizabeth Borough and Elizabeth Township who are enrolled in the WIC and SNAP programs. The outreach ministry was formed with the mission of “spreading the love of Christ to our community”. Information and Registration details are found in the flyer shown below. ​"Celebrate Recovery" meets every Monday evening at 7PM. It is a Christ-centered recovery program that offers participants a clear path to salvation and discipleship; bringing hope, freedom, sobriety, and healing. Evening Church Bible study will be held every month. Study sessions will be directed by Fr. Karl Petterson and are scheduled to be held every other Wednesday evening at 7:00 PM at the church. Bring your Bible and be ready to take notes. The reward is yours for the taking from the best selling history book.